Winter is here again, and with it comes a few of your favorite things — hot cocoa, holiday lights, snowball fights and sledding. While the weather outside might be frightful at times, that doesn’t mean this frosty season isn’t full of opportunities for family fun. Whether you’re ready to brave the cold or are looking for ways to stay warm, here are four of our favorite family activities to try this winter. Feeling a little adventurous? If you have an active family, why not take advantage of the snowy season by trying some family ski lessons? Whether you’ve tried it before or you’re beginners, developing a new skill is always a productive way to have fun. Trying out some ski lessons will challenge your bodies and brains while giving you an activity and a getaway to enjoy as a family. Book a trip to a ski lodge for a cozy winter getaway complete with some icy thrills. If you’re looking for an outdoor activity you can find more quickly in your area, going ice skating is a fun way to stay active during the chilly months. Wherever you live, you can find an outdoor skating area or indoor ice skating rink that offers family skating, community spirit and a wintry, festive environment. Some ice rinks host family days, offer weekend specials or have musical skating events for the holidays and beyond. Grab your ice skates or rent a pair at the rink! 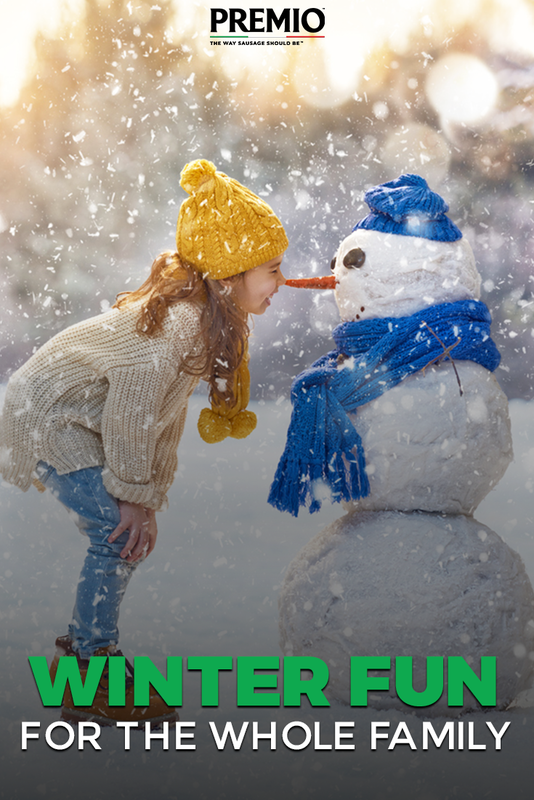 When you want a simple winter activity that doesn’t cost a cent, bundle up with your family and head out to your own backyard to take advantage of the best part of the season — the snow! Whether it’s by daylight or moonlight, sometimes nothing warms the heart like the chill of freshly fallen snow as you get back into your childhood pastimes and just play. Building a snowman is a classic activity for both kids and adults, but you can also switch it up by building snow forts and engaging in an epic snowball battle! When you’ve had enough of all that cold after your outdoor winter activities, sometimes there’s no better way to enjoy the season than by staying inside with the ones you love and enjoying good food and company. If you’re looking for a heartwarming way to heat up, how about hosting a winter BBQ? Invite your closest friends and family, celebrate the season and stay warm together while you eat. Looking for flavorful recipes to fill up on and impress your guests? Premio’s grilling sausage recipes are perfect for the occasion. Choose from a variety of mouthwatering meals, from classics like Premio Italian Sausage Burgers to unique grill dishes like our Premio Pizza Tornado kebabs. With a delicious selection of high-quality meats like real Italian sausage, spicy Italian chicken sausage, world sausage varieties and so much more, Premio provides the inspiration and ingredients you need to heat up the occasion. Enjoy your winter BBQ!